A Buick Le Sabre may not be everyone’s dream car, but for Janice Birkhead, it is a lifeline. After an abusive situation at home forced her and her 8-year-old son to move into a friend’s basement, she sought full-time employment. Yet without a car, she was unable to get to work by 5:30 a.m. using public transportation. 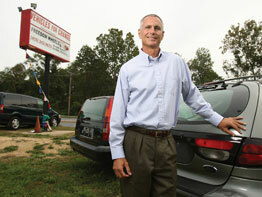 Enter Vehicles for Change (VFC), a nonprofit organization run by Martin Schwartz, president, who is an alumnus of St. Mark School, Catonsville, and The Cardinal Gibbons School, Baltimore. VFC makes it possible for low-income families to own cars, which helps them achieve financial and personal independence. Statistical studies show more than 70 percent of families obtain better-paying jobs after obtaining a car. Mr. Schwartz, 52, who uses many personal contacts and is “out there shaking hands and kissing babies” to solicit car donations, feels his career isn’t work, but residue of his Catholic upbringing and education. He prefers to treat everyone as he would like to be treated, living his life with character in mind, giving back and doing the right thing. Besides VFC, his other initiatives have included organizing National Collegiate Athletic Association men’s basketball and lacrosse tournaments in Baltimore. Whatever the venture, the entrepreneur tries to instill goodness in his clients as well. Ninety-five percent of clients are single mothers. He remembers one client who had a two-and-a-half-hour morning commute on public transportation from her home, to day care drop-off and then to work. Depending on the bus schedule was too challenging, and although she was a good employee, her company couldn’t depend on her to arrive on time. The woman purchased a VFC car and reduced her commute to 45 minutes. VFC charges $600-$700 per vehicle, finances the cars and offers tags and title services without clients ever having to visit the Motor Vehicle Administration or a bank. Because the challenge to find car donors is increasing, VFC has found an alternate way to promote the program – by forging partnerships with nonprofit organizations and schools like Calvert Hall College High School, Towson, which receives $150 per each car donated. Mr. Schwartz said that 73 percent of recipients have obtained better jobs or promotions, and have increased their income by an average of $4,800. Cars do make a difference!